Gretchen Goodbody-Gringley uses a lionfish containment device to collect fish that she spears on one of Bermuda's mesophotic reefs. 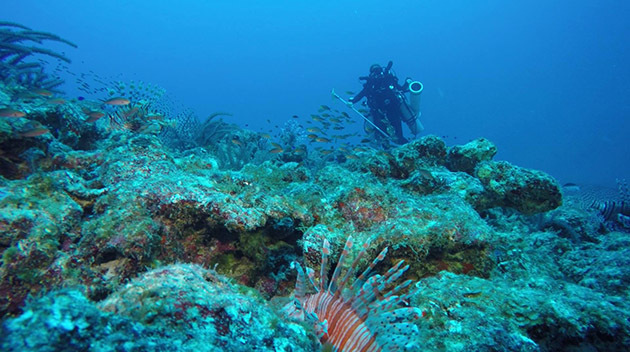 This targeted removal is being studied as one possible mechanism for controlling the invasive lionfish population and protecting local fish diversity. Tim Noyes, Gretchen Goodbody-Gringley, and Alex Chequer pose with their lionfish haul from a day of diving on Bermuda's mesophotic coral reefs. Additionally, each female lionfish can produce more than two million eggs each year during her average 16-year lifespan, making lionfish a significant threat to native fishes and reef systems throughout the Caribbean and Western Atlantic Ocean, including Bermuda. Lionfish have also been shown to negatively affect recruitment of native fishes to reef ecosystems, and have been linked to indirect effects on reef ecosystems through phase shifts from reef-dominated communities to algal-dominated communities. This research project, led by the team of Tim Noyes, Gretchen Goodbody-Gringley, and Leocadio Blanco-Bercial, is funded by the BEST 2.0 Programme (part of the European Union Biodiversity for Life flagship). This project aims to determine the effectiveness of a lionfish-specific trap, developed by the U.S. National Oceanographic and Atmospheric Administration (NOAA) and designed to remove lionfish while preserving native fish biodiversity. Also funded by the BEST 2.0 Programme, this research project, with lead scientist Gretchen Goodbody-Gringley, aims to demonstrate that targeted removal of invasive lionfish will reduce the pressuce on local fish populations, resulting in the preservation of localized reef fish diversity. 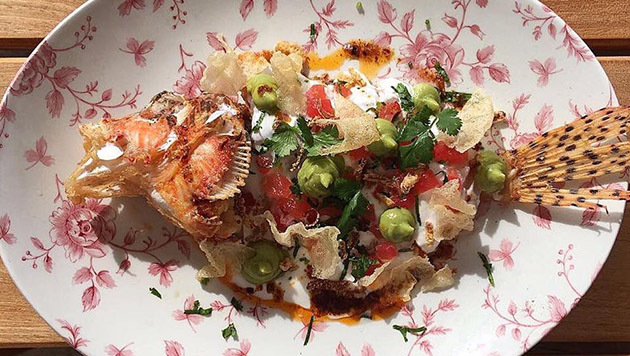 This project also aimed to promite the creation of a sustainable lionfish fishery through provisions of fresh lionfish to local restaurants and food markets, followed by surveys to determine market demand.